Top 4 reason to invest in Cuscapi - Must Read Edition! 1. The new owner of Cuscapi is the same team of pioneer that brought MYEG from scratch to a billion ringgit company. 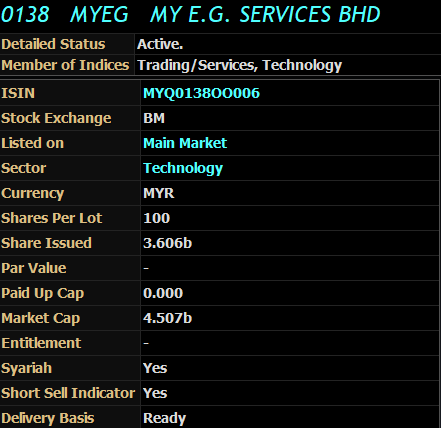 When MYEG is listed in 2007, the company had a good run and at year 2008, MYEG is having a market capitalization of approx RM 200 million. As you can see in this report by Standard & Poor, MYEG market value stands at RM 208 million on March 2008. To date in March 2019, after 10 years, this is MYEG market valuation, which is RM 4.5 billion. Put it in simple terms, if you invested RM 10,000 at start with MYEG and hold until now, disregard dividend payment, the capital appreciation is 22.5 times, which means you will be having RM 225,000 in 10 years!!! There are a lot of companies with successful run, and MYEG management made it happen in front of our eyes. 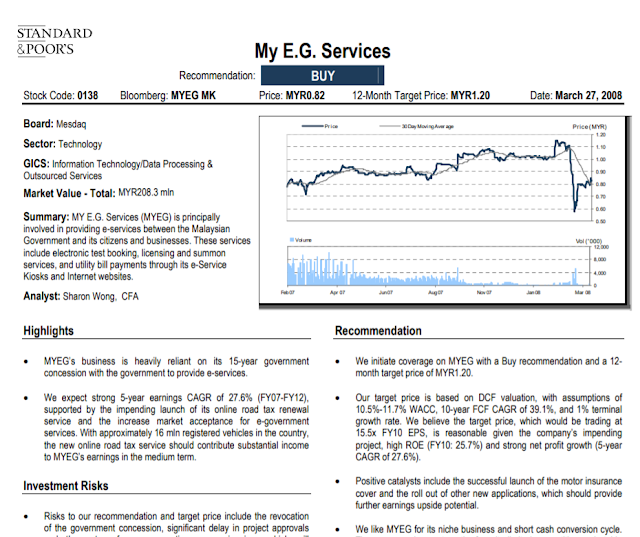 Now, Cuscapi is a remake of MYEG, and all investor that had missed those golden chance should look at Cuscapi again, and maybe include Cuscapi into your long term strategy profile. 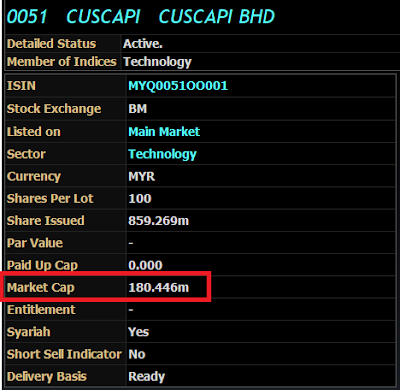 The market capitalization of Cuscapi now is RM 180 million. In 10 years time, can it be a RM 4 billion corporation again? 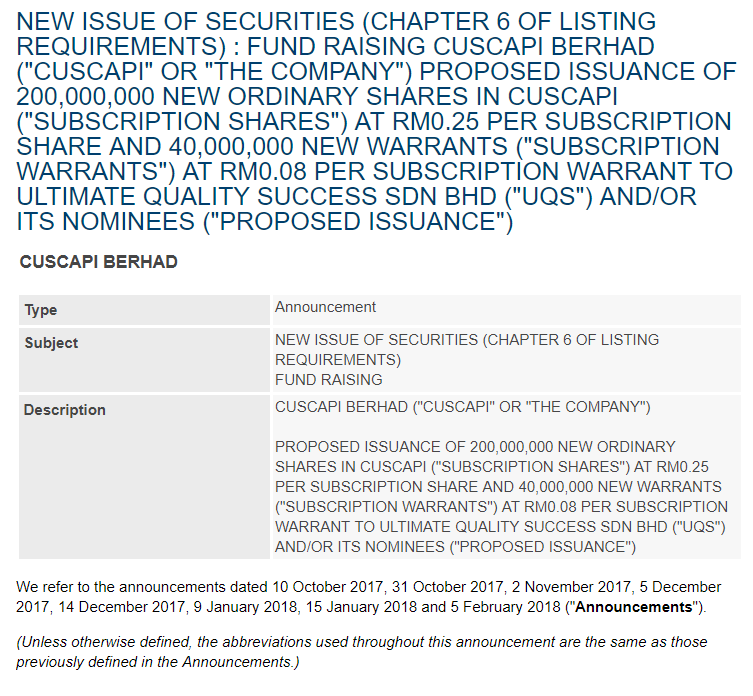 KUALA LUMPUR (March 28): Cuscapi Bhd has appointed Datuk Mohd Jimmy Wong Abdullah as executive chairman of the company, filling a post left vacant after Datuk Larry Gan retired on March 20. Wong's appointment is effective immediately. 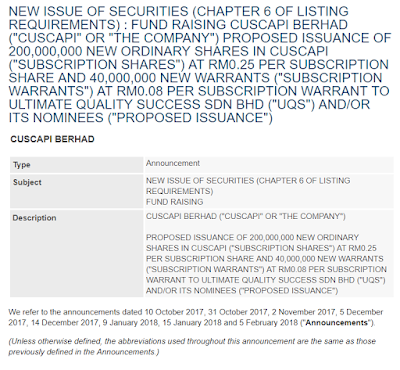 In a filing with Bursa Malaysia today, the technology solutions provider said Wong, 55, is currently an independent director of MY E.G. Services Bhd. 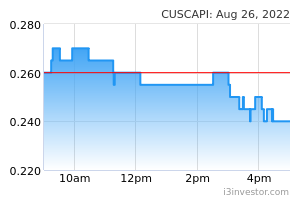 The current share price of Cuscapi is RM 0.21, which is below the cost of subscription by the new management. Venturing into Bangladesh (population 160 million people). To implement POS system in order to help Bangladesh government reduce leaking in tax from the retailer. 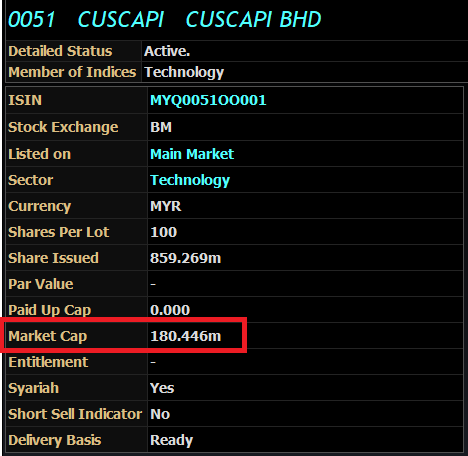 Now Cuscapi only RM 0.21, which is way below the price that the new management bought in. Moreover, Cuscapi have a strong growth market in South East Asia region. 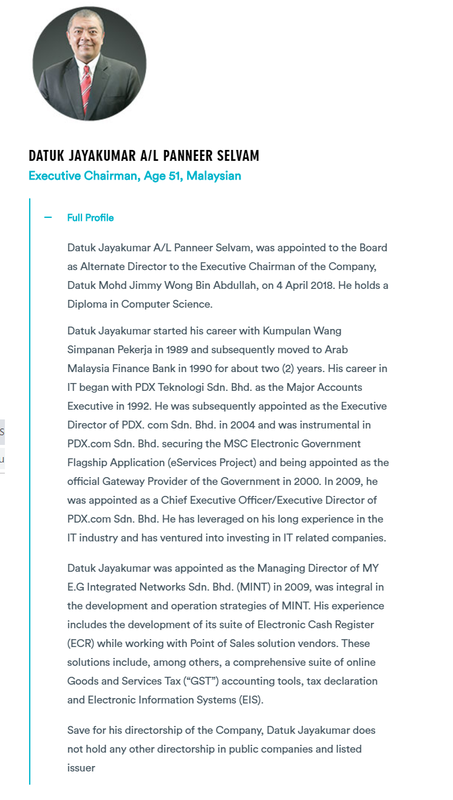 If you believe the team that had made MYEG from RM 200 million company to RM 4.5 billion company in 10 years, this is the same team again in remaking Cuscapi!!! Shinnzaii I tot Mr Wong not already resigned on last year June 2018 meh? targetinvest Jayakumar is mr wong good good buddy and friend la. Investor 999 OK I will buy 10mil shares so that you may sell your stocks today ! 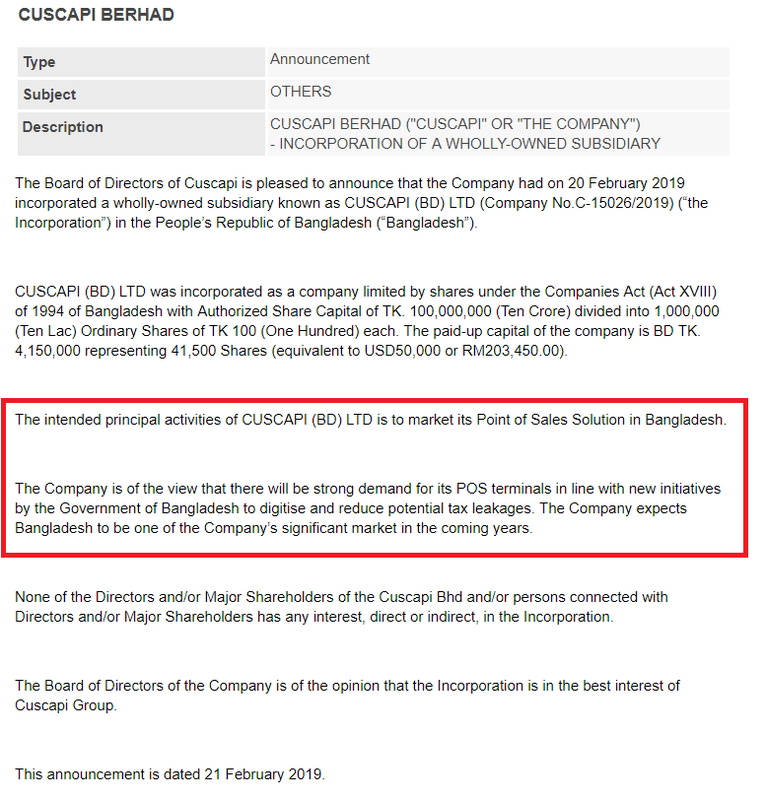 targetinvest Anyhow, cuscapi is still young because management just took over approx 1 year..
targetinvest I believe they can turn cuscapi into a growing company. vxpoison targetinvest... Good to know u did some homework on 0051. Few thing from my view below on top of what your blog written. I believed Cuscapi can do more than just POS. 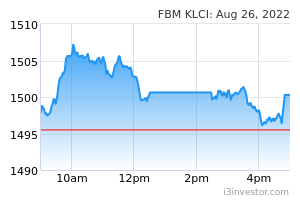 *Cuscapi owned 20% of Konsortium Multimedia Swasta (KOMMS) after they bought Litaran Pacifika for 16mil. KOMMS is the current RILEKs doing the same e-goverment services as MYEG & MYSPEED. They can revive RILEKs & overtake MYEG in long run for any e-government related project in future. 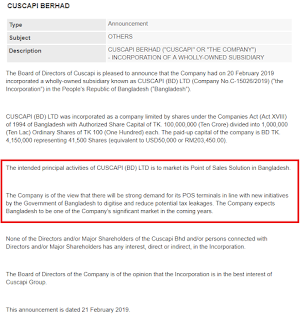 *Bangladesh EFD dongle for tax monitoring purpose, Cuscapi has the potential to JV with MYEG to develop this like how they did for our GST monitoring dongle last time. *QSR IPO soon to open more KFC & PIZZA HUT which may adopt the new c360engage for the current & new outlets. *KLIA 1&2 Cuscapi POS contract are due after 5 years since they won the contract 2015. They may renew since MAHB is busy upgrading both airport now. targetinvest Wong TS dun want to be appearing in shareholder list ma..
vxpoison Brahmal is in Cuscapi still? Anyone can clarify?